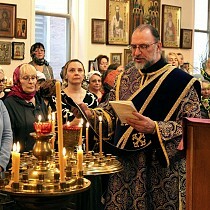 On March 31, the Sunday of the Cross, Eastern American Diocesan vicar Bishop Nicholas of Manhattan celebrated Divine Liturgy in the Synodal Cathedral of the Sign in New York City. Concelebrating with His Grace were Archimandrite Roman (Krassovsky; head of the Russian Ecclesiastical Mission in Jerusalem/), Archpriests Andrei Sommer (cathedral senior priest), Živojin Jakovljević (dean of St. Sava Serbian Cathedral in New York City), and Edward Chervinsky (cathedral cleric), Priest Jonah Campbell (rector of Christ the Savior Church in Wayne, WV), Protodeacons Nicolas Mokhoff & Vadim Gan (cathedral clerics) and Paul Wolkow (cleric of St. Seraphim Memorial Church in Sea Cliff, NY), and Deacons Pavel Roudenko (cathedral cleric) and Nicholas Ilyin (cleric of Holy Dormition Convent "Novo-Diveevo" in Nanuet, NY). 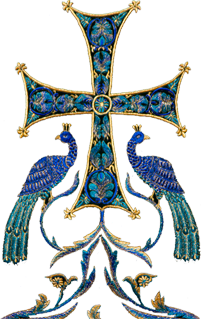 A multitude of parishioners of the Synodal cathedral came to pray, and many of these communed of Christ’s Holy Mysteries. Upon conclusion of Liturgy, Bishop Nicholas congratulated all of the believers with the feast. His Grace also congratulated Fr. Edward with his namesday and presented him with an icon of the Mother of God of the Sign. In honor of his visit to the cathedral, Bishop Nicholas also presented Fr. Roman with a copy of the icon of the Mother of God "Joy of all who Sorrow." A luncheon was offered in the cathedral hall, during which the clergy and parishioners interacted warmly.